The phenomena of the early handheld gaming devices is easy enough to understand. Arcades, and their arcade machines, were our portal into a multitude of exciting, futuristic worlds and scenarios. Any device that could even try to capture the essence of the thrill of the arcade, and bring it to the home, was an attractive proposition. If the handheld devices build design was a miniature facsimile of the arcade cabinet, all the better. 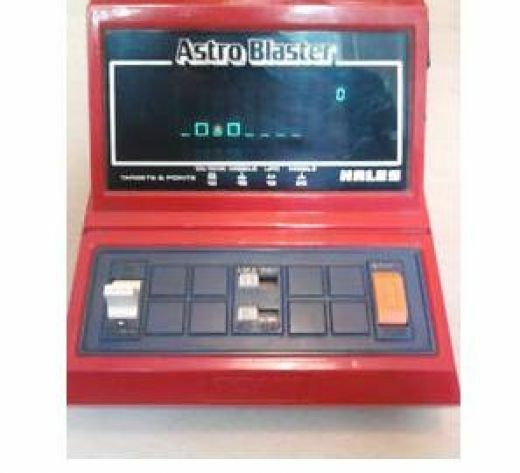 Cast in bright red plastic, Astro Blaster, which was a Scramble clone, was a great example of table top gaming. In 1982, this was as good as it got for arcade home gaming. It gave me hours of challenge.Not only was it a fair representation of the game it emulated, but its build and presentation gave a great overall package. And it had settings for Pro (Professional) and Am (for amateur), to increase the longevity. Addictive, with multiple stages of gaming, giving variety and challenge, it remains a fond memory and earns a deserved place in my Gaming Timeline.